처음에는 적은용량 부터 시작 하며, 공복을 피하여 드시기 바랍니다. 위가 약하신 분들의 속이 쓰리거나 위산이 역류하는 것을 방지한 제품 입니다. 이용방법 : 1일 1회 식후 비타민C 파우더 를 1 티스푼 물에 타서 드십니다. * 물에 타신후 거품이 꺼질때가지 약간 기다리신후 드십니다. 쌀, 설탕, 인공감미료, 인공향료, 인공색소, 또는 방부제 가 함유되지 않았습니다. 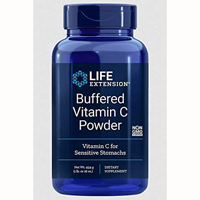 Mix one teaspoon of Buffered Vitamin C Powder into a glass of water. Vitamin C, ascorbic acid, is a water-soluble substance found in citrus fruits and green vegetables. An important antioxidant, vitamin C protects the body from free radicals and fights oxidative stress,40,41 both of which threaten the immune system. In fact, a major immune-supporting activity of vitamin C is boosting glutathione levels in human lympho-cytes,42 cells that make up about 25% of all white blood cells in the blood. Because humans do not manufacture vitamin C internally, it must be obtained through dietary sources or supplements. Few people realize, however, that vitamin C is a water soluble nutrient that is quickly oxidized and excreted by the body,45 which limits its efficacy. Until now, those seeking to capture vitamin C’s optimal health benefits have had no choice but to consume it several times throughout the day. Fortunately, a flavonoid antioxidant known as dihydroquercetin functions as a vitamin C “supercharger.” Studies demonstrate that dihydroquercetin acts to inhibit the oxidation of vitamin C, thereby helping to maintain its concentration and to recycle vitamin C throughout the body.46,47 This synergistic relationship between dihydroquercetin and vitamin C greatly enhances the efficacy of both molecules in the body’s organs and tissues. Vitamin C with Dihydroquercetin was formulated for those seeking to obtain optimal efficacy and antioxidant protection from their vitamin C supplement. Ascorbic acid is the acidic form of vitamin C, and even when encapsulated can cause gastric upset or diarrhea for some people. This can often be alleviated by consuming it with meals. Start with a low dose then gradually increase. If you have a stomach ulcer, use an antacid, buffering agent, or a buffered form of vitamin C. Calcium carbonate and magnesium oxide are effective antacids. Unbuffered ascorbic acid in the mouth may be harmful to tooth enamel. COPYRIGHT joalife, INC ALL RIGHT RESERVED MAIL: .